Restoration of the Waterways: the Beaver is our Ally. Translation by Paul Ramsay. (draft). In 2011, a revision of the law on the protection of waters was accompanied among other things by the launching of a permanent programme for the restoration of rivers and streams at local level. The present document shows how the activities of the beaver can be useful for the ecological improvement of aquatic habitats within the framework of the implementation of this programme and how it is possible to avoid conflicts with this rodent. This document is intended for specialists in the federal, cantonal and communal establishments who are competent in the subject, as well as for those in the offices of engineers and environmental consultants. The updated law on the protection of waters and the corresponding regulations define a minimal space that is reserved as riparian zone. This minimum space depends on the width of the bed (cf fig.1). The area surrounding the watercourse can be used as sacrificial or as extensive meadowland, or be covered with woody plants. These habitats are considered as surfaces for the promotion of biodiversity, giving priority to its contributions. The use of fertiliser and pesticides is not allowed there. – high water can be allowed to flow without causing damage. – waters are not polluted by substances coming from the surrounding area. – the waters are colonised by a fauna and flora that are characteristic of that water course. – the terrestrial and aquatic environments form a connected network. – the landscape is diverse in structure. So that these objectives can be properly met, the space reserved for waterways must generally speaking be wider than the minimal space cited in the regulation on the protection of waterways. The publication entitled ‘Main ideas – Swiss waterways’ prepared by several federal departments can serve as reference. From now to the end of the century it is foreseen that 4000 km of waterway will be restored. It falls to the cantons to designate the rivers and streams concerned. The costs and associated costs will be borne jointly by the Federal authorities and the cantons. The total of the federal subsidy granted for a project of restoration will depend essentially on the foreseen size of the space reserved for the waterways. The wider the area, the more will be the contribution of the State to the total cost of the project, from where the least expenses (in absolute numbers) for the canton en depit of extra costs for the purchase of land. The acquisition of areas of ground necessary for restoration is to be carried out within the framework of a fundamentally integrated improvement with exchange of land. The loss of farmers’ productive land can be compensated for by improvements to their infrastructure, notably by the regrouping of basic equipment of the farmer or by the construction of modern infrastructure such as farm roads (Suissemelio et OFAG 2011). The management of water courses is not the prerogative of humankind.The beaver is itself very active in this domain: to the extent that its talents as architect have to be taken into account in the planning and realisation of projects of riparian restoration. Beavers are capable of shaping freshwater landscapes to their advantage. No other living creature apart from humankind can do as much. From which comes the following question: how has this rodent developed such an astonishing capacity? To serve as habitat for a population of beavers, the waters of a stream must flow gently and be a minimum of 50 cm deep, even in times of low flow. In these conditions, beavers can swim easily, transporting branches for their building projects and building up stores of food for the winter (fig.3), dive under the water to avoid danger and to dig into the banks to make burrows whose entrance must always remain submerged. Such conditions are sufficiently rare nowadays, 15 million years since the genus Castor first made its appearance , because water courses naturally undergo an alternation between low water and flood. When precipitation is heavy, they swell and flow faster. In time of drought and in winter, they attenuate and become a single ribbon of water. In the course of evolution, the beaver has learned how to render these streams perfectly habitable. In the zone of retention created by the dam he has built, the water level remains constant, the entrance to the burrow is never dry and the speed of the current is considerably reduced. Its activity as architect is not limited to the building of dams. In order to obtain branches which it needs to carry out its building works and create reserves of food, the beaver strips whole parcels of forest. And to make connections between the little water courses present on its territory, it digs canals. In behaving thus over millions of years, the beaver has created certain habitats in the freshwater landscape that would only have been found occasionally before its intervention: ponds, still waters, marshes, bare sunny clearings in alluvial forests. In this sense the beaver was an essential factor in the evolutionary process. Certain species of the fauna and flora, typical of the riparian habitat, have become adapted to landscapes modelled by its needs, and it is certain that more than one emerged thanks to it. With the almost total extinction of the beaver in Europe at the beginning of the 20th Century, the species that share its habitat have also been threatened. Since its return, the situation has improved in many places: amphibians, reptiles, water birds, dragonflies and other insects, as well as different plants and fungi, benefit from the constructions of the builder rodent. The same thing goes for fish: true, sediments in suspension retained by dams can clog up the redds of trout, but the water that flows on downstream over the gravelly bottom of the river is only the clearer because of this. For migratory fish, beaver dams do not constitute completely uncrossable or permanent obstacles: they can be submerged by flooding or yield at different places. Studies carried out in Europe and North America show that the diversity of species of fish present in a water course is increased when the water is colonised by beavers. All that makes the beaver an ideal partner in projects for the the regeneration of rivers, and what is more, a factor in reducing the cost of such projects. It is, therefore, no longer necessary to remodel water courses using diggers at great expense; only a few civil engineering operations need to be carried out at the outset of a project. The beaver will then take on the responsibility of relaunching the freshwater habitat for nothing and in a completely natural way – as long as one leaves it enough space. In some places, the beaver’s activity can equally share in protection against floods, since dams placed in the upper reaches of small water courses can attenuate peak flows of flood water (Nyssen et al. 2011). But it is still necessary that riparian areas should be wide enough. In a landscape exploited intensively by humankind, an animal that digs burrows in the slopes of banks and holds back the water of streams is not always welcome: its works interfere with those of humankind, which modify and regulate water courses to his own advantage and often exploits banks to the crest of their slopes. Technical solutions exist to resolve many of these conflicts, the most enduring being the widening of the riparian zone. Three quarters of the water courses of the Swiss Plateau are bordered by tracks that are accessible to motor vehicles, whether from one side or both. By digging burrows in the slopes of banks, beavers create a risk of collapse. The building of dams constitutes another reason for conflict between man and beaver, because the retention of the water can bring about the raising of the water table, with possible saturation of the soil as a consequence. The beaver is a protected species throughout Switzerland. This protection includes the habitat of the rodent, to the extent that it is forbidden to destroy its lodges or dams without exceptionally granted licences from the competent authority. If certain isolated individuals cause substantial damage or threaten zones of human habitation and infrastructure of public interest, they can be captured and killed, in conformity with regulations for the management of hunting. Such measures of regulation are authorised only for a limited period, which must be used to good effect to prevent further damage. Because the calm that follows the killing of an animal is generally of short duration: another beaver will usually come to dig in the same place. > Wire mesh and stone stopping nets placed on the surface of the bank make a barrier that is uncrossable for beavers, as well as musk rats and coypu which are spreading in Switzerland (size of mesh 10X10 cm for the beaver, and 5X5 cm for the musk rat and coypu). The installation of artificial burrows in netted slopes (Beck and Hohler 2000) allows beavers to feel at home (fig.5 right bank). Naturally, the installation of such devices should not compromise either the stability of the slope, or nearby tracks and roads. > it is essential not to make breaks in the embankment of a water course whose bed lies above the level of the land neighbouring it, or when it is a matter of an embankment against floods, or forming part of a hydro-electric operation. It is better to protect the embankment with the help of steel mesh nets or gabions. If it is possible to proceed to the exterior reinforcement  and the levelling of the embankment, the mesh can be installed directly in the heart of the embankment. Beavers can thus dig as far as the artificial barrier without causing damage. The embankment on the right bank must be laid out in such a way as to make up for the loss of stability due to the digging of the beavers (fig.5 left bank). Technical measures for the prevention of damage by beavers are onerous and contribute little or nothing to the ecological restoration of water ways. They do not allow for the creation of new habitats or enrich the landscape. In this sense they are not appropriate except in places where the replacement of the infrastructure involved is impossible or too expensive. On the other hand, the enlargement of space reserved for waterways constitutes a real plus for nature and the landscape. It extends the possibility of surfaces and structures near to their natural state, favours the development of varied habitats and resolves most of the conflicts between humankind and the beaver by limiting the space over which the beaver is likely to interfere with human activities. The risk of the collapse of tracks is reduced from a distance of about 5 metres from the top of the bank, because it is rare for beavers to dig beyond this limit. Standing water created by beavers can be a problem for crops near banks, but only over small areas. The floodable area is limited to a riparian strip between 10 and 20 metres wide, except in extremely flat areas where the soil is gravelly and permeable.Unless this strip is being intensively farmed, coexistence with the beaver should not prove to be a problem, except in the case of backing up of water in drains (read fig.7). As a consequence, restoration projects must give priority to areas of conflict. In the same way that the widening of space reserved for the riparian edge, which is the best arrangement for river banks, is a preparation for eventual conflicts. Levelled banks being ill adapted to the digging of burrows, the slope of the embankment should be between 1:5 and 1:3 (maximum) on the stretches where digging by beavers is not wanted. The transverse section of the water course is bigger in this case, which improves the flow capacity as well as the retention of water in case of flood. One may foresee steeper banks (with a slope more than 1:3), ideal for the construction of burrows, on stretches where no infrastructure is installed in the immediate proximity of the water or on the ridge of the slope. (Fig. 6). When a beaver builds a dam in a very flat agricultural area, it can cause retention of water in nearby drains. Trapped sediments can then block the drains, leading to flooding upstream in meadows and fields. An appropriate drainage system can help to resolve this problem. The other option is to transfer the affected areas into wet meadows which become home to a great diversity of species. According to a census carried out by the federal Office of agriculture in 2008 (OFAG 2010), there are 192,000 hectares of artificially drained farmland today in Switzerland, perhaps 18% of the usable agricultural area. Two thirds of the drainage schemes date from before 1960. And a third of the network is in a bad state or in an unrecorded condition. There exists, therefore, an important need for renovation. In a general way, the outfall of a drain joins the stream just above its bed. If the beaver colonises or is likely to colonise such a water course, the renovation of drains should at least envisage the adoption of another solution – especially in the context of a project of renovation. No need to reinvent the wheel. At Konolfingen for example (BE), a system that is compatible with the presence of beavers has been working for 100 years: in the Hünigenmoos, whose drainage for agriculture began at the beginning of the 20th century, drain pipes do not pour directly into the stream de la Chise, but into two collecting drains, dug parallel to the banks. The collectors carry the drainage water as far as a place where the fall increases, at which point it can join the main stream. Such measures are easier to instal as part of a large scale project of improvement, applied to an extensive area, and subsidised by the Confederation and the canton. The renovation of a drainage scheme carries with it considerable costs, estimated by OFAG to amount to 25,000 Swiss francs/ha. (OFAG 2010). Continued agricultural exploitation may also prove to be expensive, especially if it is necessary to pump water, which is actually the case for 11% of the drained areas. Taking account of the cost incurred, the opportunity to renovate a drainage scheme depends particularly on the nature of the soils involved. According to a cautious estimate by OFAG, about 70% of soils drained are in areas of intensive arable cultivation (OFAG 2010), which the sectoral plan of the Confederation recommends should remain as such to a large extent. In this set up, the renewal of drainage schemes is therefore an appropriate measure. For other areas, on the other hand, it is recommended to proceed first to an evaluation of the soils. If it appears that the necessary investment will bring very little advantage in terms of agricultural exploitation, the alternative solution lies in transforming the land near the water course to wet meadowland, with the support of the farmers (fig.8). This approach can be particularly profitable in the context of a project of restoration because the temporarily flooded areas constitute habitats of extreme richness, especially for species of amphibians threatened with extinction. Wet meadows used in such an extensive way are considered to be eligible for grant aid. Here are several examples of existing restoration projects, which show how suitable management and an enlargement of the riparian zone can allow the renewal of embarked streams, to the extent that beavers cause no conflict. The suggested choice is in no way exhaustive. In the 1990s, the canton of Geneva launched a programme of restoration for its water courses, and set up a special fund for financing it. One of the numerous projects carried out since then concerned a stretch of the Hermance inclusive from the Pont Neuf to the Pont des Golettes, to the south-east of Anières. As this stream constitutes the frontier with France, its management required the cooperation of the two countries. Before the execution of the project, the bed of the Hermance at the level of this stretch was narrow and embanked by rock. On the left bank, trees grew to the crest of the embankment, while the right bank was entirely bare of trees. The restoration took place in 2010. It consisted of grading the slope of the banks, in bringing a morphological diversity to the river bed and enlarging the space allowed to the waterway, allowing it to expand from between 10 and 30 metres up to 50 metres wide (fig.9). Aquatic and marsh species such as the bulrushes, iris, water plantain, loosestrife , common loosestrife, and several sedges and rushes were planted. To shade the waters and prevent excessive warming of the water in summer, copses were planted on the banks. Food was thus more abundant for the beavers, which chose a managed burrow under the Pont des Golettes as their home, and actively exploit the restored water course. If the waters of the Urtene upstream of Kernenried (BE) have been able to benefit from a project of restoration, it is partly thanks to the sewage works at Holzmühle, carried out in 2001. Because the restoration work had for effect especially the improvement of the quality of the water of this badly polluted stream and as a repercussion the its improvement for fishing. To exploit this potential it was necessary only to manage the over dull course of a stream that was entirely embanked. This programme of management undertaken between 2003 and 2007 allowed the enlargement of the space allowed to the water from a width of 15 to 20 metres. In the programme of reallocation of fragmented parcels of land necessitated by the building of a new stretch of Rail 2000, acquisition of land was made easier by the fact that farmers became aware of compensations in nature . Today, the Urtene has regained a bed of great structural diversity (fig.10). The varied vegetation of the banks and slopes (big deep rooted plants, shrubs and trees) give shade to some of the stretch. The waters have regained their proper dynamic: sandbars and gravel beds are deposited on flat banks, while zones of deposition and erosion are formed on steeply sloping banks. A survey carried out in 2008 concluded that a net improvement of the ecological situation had taken place. The number of fish has increased considerably and a new species that values the current  has appeared: the barbel. 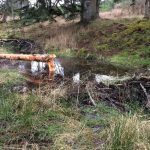 The revitalised stretch has been stocked with brown trout and beavers dug their first burrow soon after the works had been completed. Upkeep is the responsibility of a water management group (Wasserbauverband Urtenebach) which has prepared a management plan and employed two farmers part time to carry out works. Some years ago, the Grabenbach used to become engulfed in a subterranean gallery at the east entrance to the village of Münsingen and did not flow out again, except in times of great floods, as in 1968 and 1977, when violent storms made the water overflow and caused damage valued at millions of Swiss francs. To avoid a recurrence of such phenomena, a holding pond with a capacity of 40,000 cubic metres was built in 2009 at Mülital upstream of Münsingen and a new bed was laid out above ground downstream from the village. To restore the subterranean stretch to the open air the bed of humus had to be taken from a stretch of land 20 to 30 metres wide, so that today the banks of the Grabenbach are adorned with a ruderal vegetation rich in species. The new watercourse flows into the Aaregiesse. The project is accompanied by a long term monitoring of results, the first reports from which are promising: the aquatic vegetation is luxuriant (fig.11), the invertebrate fauna is distinguished by a great variety of species as well as a significant biomass: the brown trout is breeding successfully. Several beavers, settled lower down on the Giesse, have already been observed in the Grabenbach. The management of the waters is the responsibility of the commune of Münsingen, which entrusts the works to specialist employees of the commune workshops. Built more than one hundred years ago, the Rheintaler Binnenkanal drains the marshes of the Rhenish valley of St.Gall. In May 1999, when an exceptional flood caused the industries of Rüthi damages estimated at several millions of Swiss francs, it appeared obvious that this canal was no longer able to cope with such accumulations of water without flooding.Studies then showed that the lowering of the water level could improve the protection against floods that it would be necessary in order to achieve that considerably to widen the bed of the canal as well as the riparian zone. The project, carried out from 2006 to 2007 on the stretch of the interior canal stated downstream from Rüthi consisted of widening the bottom of the bed, which only measured 8 metres, from 16 to 20 metres with excavators. The riparian zone, which was only twenty metres wide was expanded to a maximum of 65 metres (fig. 12). Initially rectilinear, the canal now includes meanders, branches in several places and forms little islands of gravel, zones of calm water and ponds separate from the main stream in time of drought. The revitalisation has had an extremely positive impact on the natural restocking of fish, to the extent that young nases (Chondrostoma nasus) have been noticed on this stretch after several years of absence – just at a time when the species is threatened with extinction in Switzerland. The nearest population of beavers is living about three kilometres away, on the interior canal of Werdenberg (2013). For the present, beavers have not colonised the restored stretch, but they would find the necessary habitat there to build lodges. the management of these waters is assured by the Rheinunternehmen establishment, on a mandate from the Rheintaler Binnenkanal association. This association was set up by the 12 communes situated along the interior canal with the objective of taking on the management of the waterways. Rheinunternehmen, a public body, with a team of specialist of its own, is affiliated to the Department of bridges and highways of the canton of Saint-Gall. The ecological quality of a restored stream does not depend only on the levelling and the carrying into effect of the work of restoration. The continuing management of the waters and the vegetation of the banks is also all important. In general, it is wise to found an association for the management of the waters for the stretch concerned, or to entrust the management to an existing management cooperative. The farmers of the agricultural land bordering the water course can thus carry out the necessary management on the basis of a previously arranged plan. Advice and offers of continuous training should ensure that the carrying out of those works of care and upkeep of the revitalised waterways is properly done. The best being the enemy of the good, it is sometimes preferable to do nothing, especially in the sectors where the stability of the bed and the flow capacity are already assured. In that way nesting sites for birds can be spared, as can the habitats of many insects, which need time to develop. In the same way, it is not necessary to cut the meadows every year. >To prepare reserves of food for the winter, beavers need to find enough tender wood near the river banks. If trees have been cut too low, beavers, deprived of their basic food, will have to migrate to a neighbouring stretch and dig new burrows there, which can in its turn lead to conflicts. >It is, therefore, advised that so far as possible beavers should be entrusted with the cutting of wooded banks and not to use the chainsaw except as a backup. >When burrows cause collapses on the banks it is not always necessary to fill the cavities. Sometimes a biological framework will be enough to fix the problem: this solution consists in planting all around the zone, on quite a large area, bushes with deep rooting systems, such as willows or alders. The subsidences are thus easily reparable by the farmers and the banks are stabilised. A staged riparian vegetation can then develop for the long term. > The smaller the areas of intervention, the better. Mowing the grass in short stretches allows little animals the possibility of finding shelter near the area of intervention (fig. 13). >In the area of retention of beaver dams, it is noticeable that there is an enrichment of nutrients, which favours the growth of vegetation in the waters concerned and speeds up the deposition of sediments. On very flat stretches carrying much sediment, the process can be slowed down by the installation of sand traps.